Flowing through the Coast Range, the "great river," as it’s known by the local Tlingit, boasts vast glaciated mountains, icebergs, hot springs and First Nations fish camps. 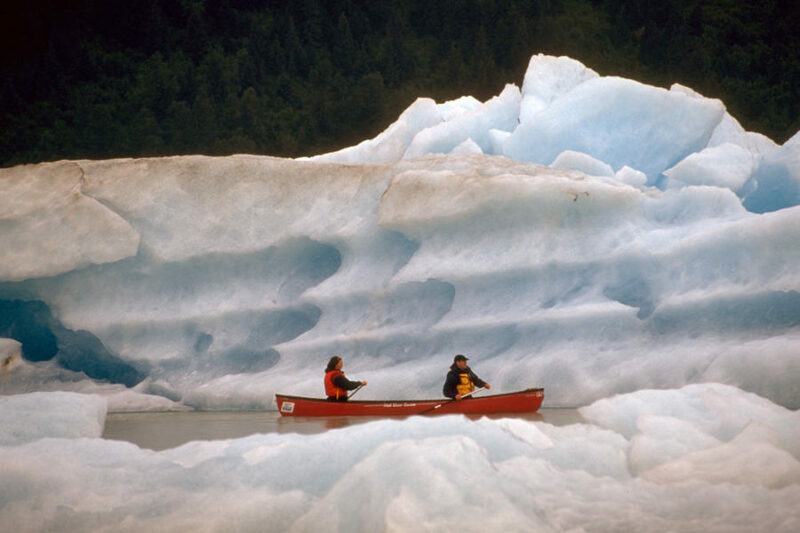 Many have called the Stikine River the “gateway to the vast interior of northwest Canada,” making a canoeing adventure on this wilderness highway unforgettable. 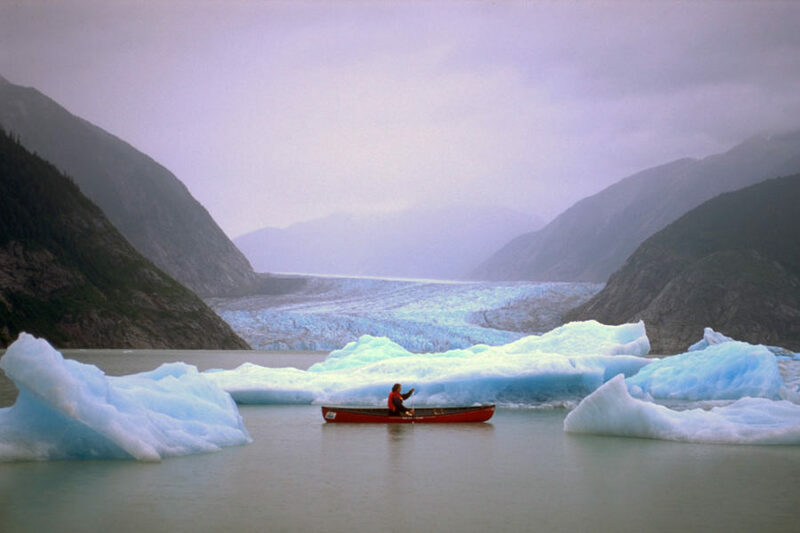 Coursing through the Coast Range, the Stikine River or “Great River,” as it’s known by the local Tlingit, boasts vast glaciated mountains, icebergs, hot springs and First Nations fish camps. Canoe one of the last great wilderness rivers of B.C. We canoe in two-person canoes along this coastal range river from Telegraph Creek, British Columbia to Wrangell, Alaska over 10 river days. We’ll be travelling downriver 267 kilometres (165 miles) with an elevation drop of 200 metres (600 feet). Skill Prerequisites: Novice moving water experience is recommended. If unsure of your ability, please call with any questions: 1-800-297-6927 or (867)-668-3180. The following is a tentative agenda and has been designed with much thought to capitalize on the most scenic and exciting parts of the river, while making time on other sections. Your guides will adjust the schedule to make the best use of river and weather conditions. The scheduled flights arrive in Whitehorse throughout the day. Aim to arrive by 6 p.m. Please make your way to your hotel and plan to rendezvous with your guides at the High Country Inn at 8 p.m. for an orientation meeting (enquire at the desk for meeting room). Hotel costs and meals while in Whitehorse are not included in the trip fee. There will be a chance for last minute questions concerning clothing, gear, packing and other details. Whitehorse is a great place to spend a few extra days. We’ll send you a visitor’s guide. The historic sites are interesting and there are day hikes, gold panning float trips through Miles Canyon and 4X4 outings in the region. We’ll meet 8 a.m. in the hotel lobby after breakfast (not covered). After driving to the airport we will fly to the “picture perfect” gold rush town of Telegraph Creek on the Stikine River downstream of the Grand Canyon of the Stikine. 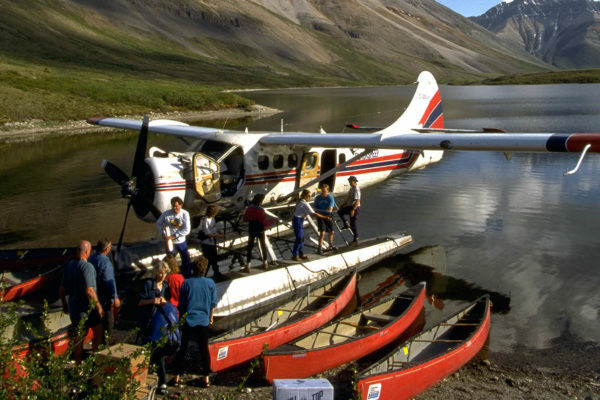 Once in the tiny community of Telegraph Creek, we’ll load the canoes and prepare to travel the short distance to our first camp in the vicinity of Tsikhini River. Once on the Stikine you’ll immediately feel the speed and power of this grand river. Floating past First Nations fish camps, we’ll pass the tiny community of Glenora. Now nearly a ghost town, it once held 10,000 occupants and was the head of steamship navigation. From here the river begins its cut through the highly glaciated Coast Range. Camp will be in the vicinity of Jackson’s Flats. The swift-flowing but smooth river will whisk you further into the land of the Stikine. Increasingly larger mountains appear on the horizon and we watch for grizzlies, moose and Mountain goats. Camp will be in the vicinity of Little Canyon. Making our way into the dramatic region of the Flood River Valley, many glaciers begin to dominate the horizon. Camped along the river, we’ll read stories of the rich First Nations and gold rush history of the region. The river channel broadens and braids. New panoramas await around each bend. We’ll camp in the region on Mud Glacier – Don’t worry! It’s far more beautiful than the name implies. Flood and Mud Glaciers are but two of the ice caps that dominate the valleys feeding the river in this stretch. Seals may be seen in the main channel at this point as they follow the spawning salmon. 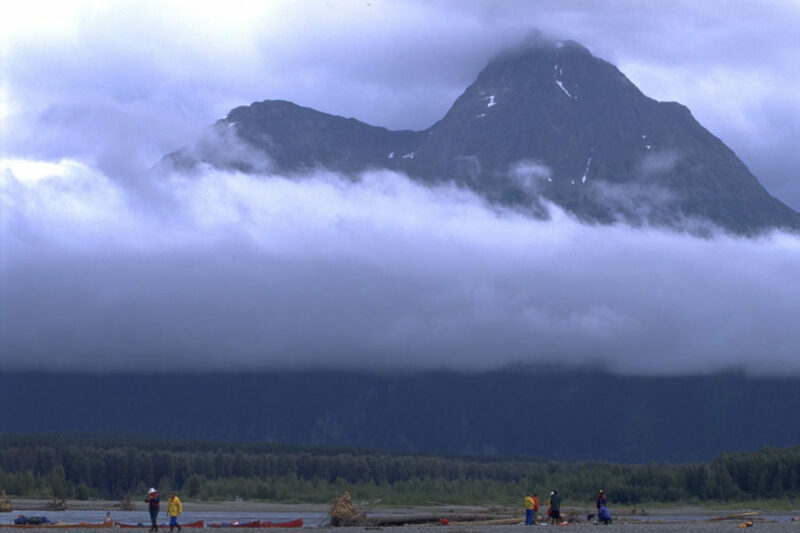 The Great Glacier once breached the river and was the sight of a clash between Tahltan and Tlingit warriors. We’ll camp here and a hike from the river will take us to an ice berg-dotted lake at the foot of the glacier where it now resides. 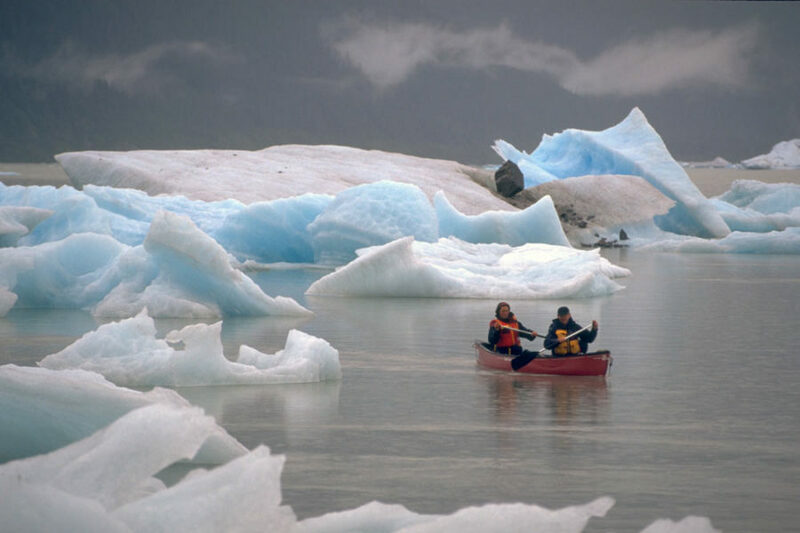 If possible, we’ll use our boats to paddle among the ice flows. This portion of the Stikine passes into the Coastal Western Hemlock and Mountain Hemlock biogeoclimatic zones. 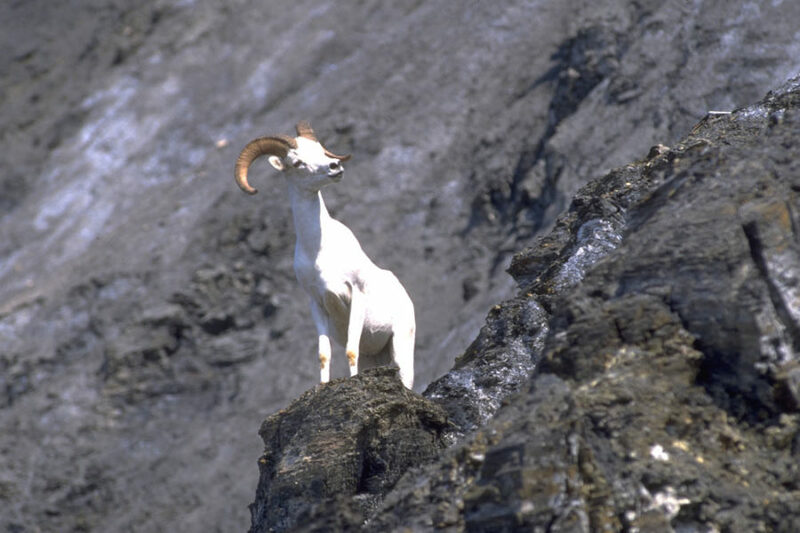 Even at this latitude there is a rich rain forest ecosystem supporting eagles and ravens, steelhead and salmon, bears, foxes, wolves, Mountain goats and numerous other mammals. Its wetland habitats are particularly important to water fowl and moose. Sitka spruce, cottonwoods, yellow cedar, white fir and abundant wildflowers are present. Nearly a million migrating birds of the Pacific Flyway use the delta and wetlands. Back on the river your guides will organize fresh salmon at a local fish camp. Camp will be in the vicinity of Goat Creek Islands. After a paddle down a hidden back channel you’ll be rewarded by a soak in the luxurious hot water of Chief Shakes Hot Springs. Splendid scenery will top off a memorable day. If river conditions allow, we’ll make our way into Shakes Lake for a closer interaction with spectacular glaciers. Making our way through the delta we’ll enter the rich coastal environment of Frederick Sound. The scenery continues to please. 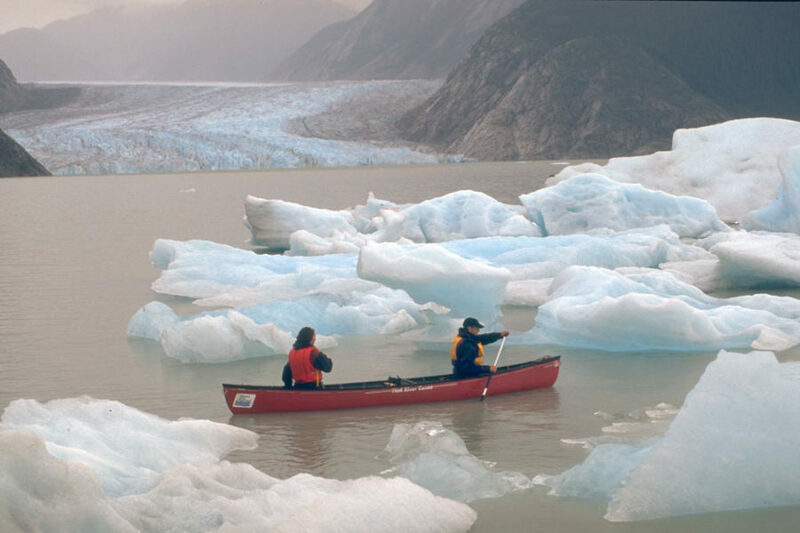 Skirting the shoreline, we’ll paddle to the colorful fishing community of Wrangell, Alaska. Camp will be in this coastal community and you’ll have time to explore the town. We’ll leave Wrangell in the afternoon via the Inside Passage Ferry. This provides a classic view of the famed Alaska Inside Passage. Steaming through the villages of Petersburg, Sitka and the state capital of Juneau, we’ll have berths. Showers are available and you’ll have access to all the ship’s facilities. Be sure to have proof of your citizenship with you for U.S. and Canadian customs. We’ll arrive in the historic gold rush town of Skagway, Alaska early afternoon and have time to wander the colourful streets, enjoy the shops and meet for dinner at one of the local restaurants. We will then begin the 2-hour journey back to Whitehorse by van. The dramatic peaks of White Pass will keep you well engaged. You can book your flight to leave Whitehorse anytime, otherwise you may want to relax for one more evening and fly out the next day. After goodbyes and a last look around town, we will head for home. with a cargo of fond and spectacular memories. 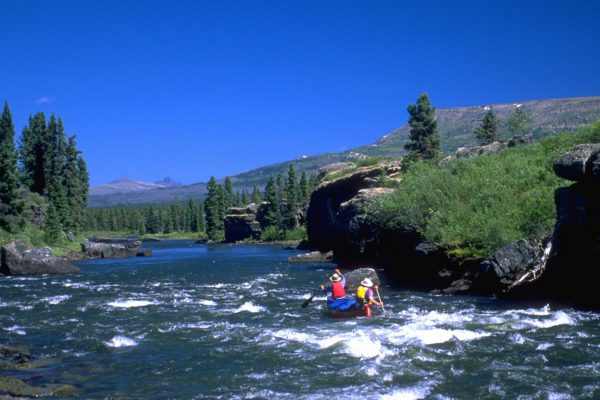 The Stikine River is an exciting adventure for paddlers comfortable with Class II and III whitewater.